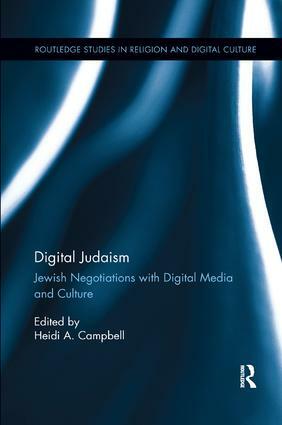 In this volume, contributors consider the ways that Jewish communities and users of new media negotiate their uses of digital technologies in light of issues related to religious identity, community and authority. Digital Judaism presents a broad analysis of how and why various Jewish groups negotiate with digital culture in particular ways, situating such observations within a wider discourse of how Jewish groups throughout history have utilized communication technologies to maintain their Jewish identities across time and space. Chapters address issues related to the negotiation of authority between online users and offline religious leaders and institutions not only within ultra-Orthodox communities, but also within the broader Jewish religious culture, taking into account how Jewish engagement with media in Israel and the diaspora raises a number of important issues related to Jewish community and identity. Featuring recent scholarship by leading and emerging scholars of Judaism and media, Digital Judaism is an invaluable resource for researchers in new media, religion and digital culture. Heidi A. Campbell is Associate Professor of Communication at Texas A&M University and Director of the Network for New Media, Religion and Digital Culture Studies. She is author of Exploring Religious Community Online (2005) and When Religion Meets New Media (2010) and editor of Digital Religion: Understanding Religious Practice in New Media World (2013).